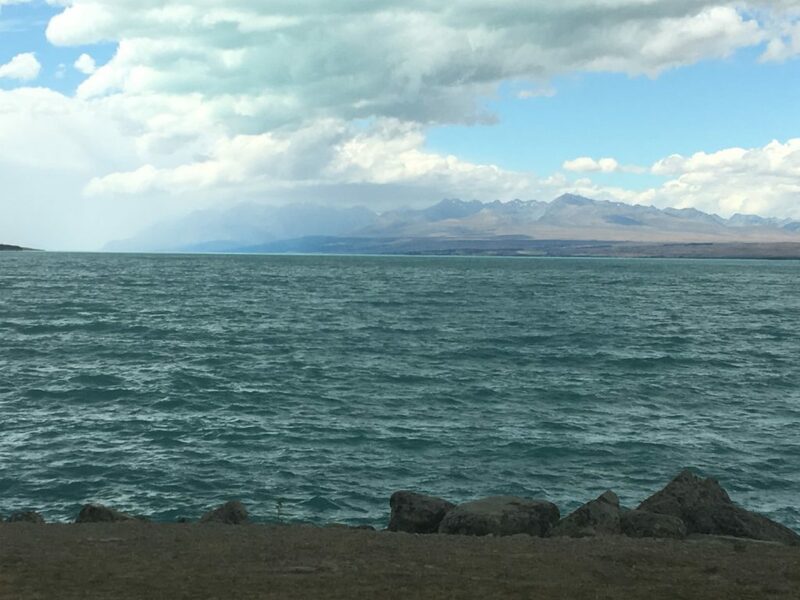 Lake Tekapo has been my least favorite city so far. It is overrun with tourists (of which I was one) and the attitudes in the people that always seem to accompany this blight. You might call it the Estes Park of New Zealand. Even still, the lake was beautiful and I am glad that I stopped there. I met some interesting people at the local campground, all of which were also cycling. Most of them were following the Alps-to-Ocean mountain bike trail. The next morning (1/31) I checked the weather forecast and found that the winds were supposed to hit about 35 kph. However, for much of the day, they would be at my back, so I opted to press on to Omarama, an 80m km ride. 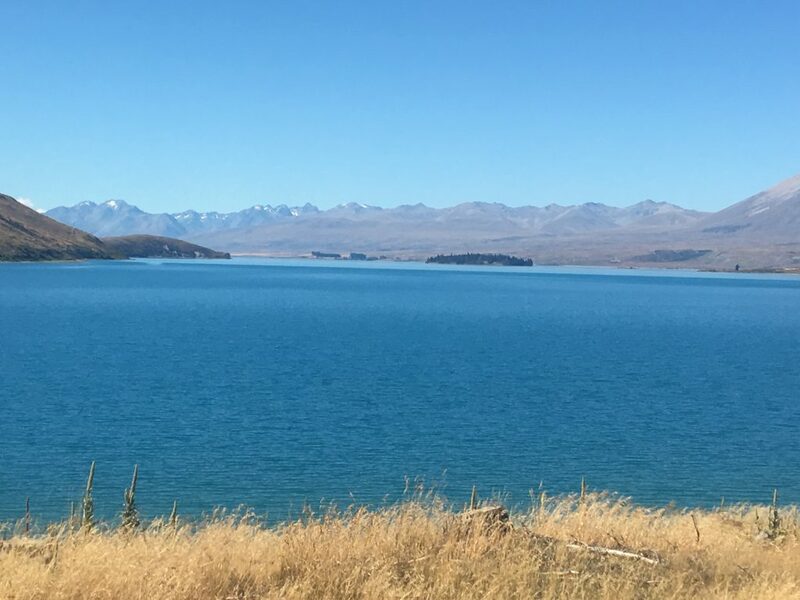 For riding out of town, I had my choice of the highway, or an alternative route that paralleled a long canal that joined two lakes (Tekapo and Pukaki). I decided to chance the latter, and took off on what started out as a difficult mountain bike path. I had been told to hang in there, however, because much of it was supposedly paved. This proved to be true, and I had a very good 5-10 miles, literally being blown by the wind, along a completely abandoned paved highway. (It was gated on either end). 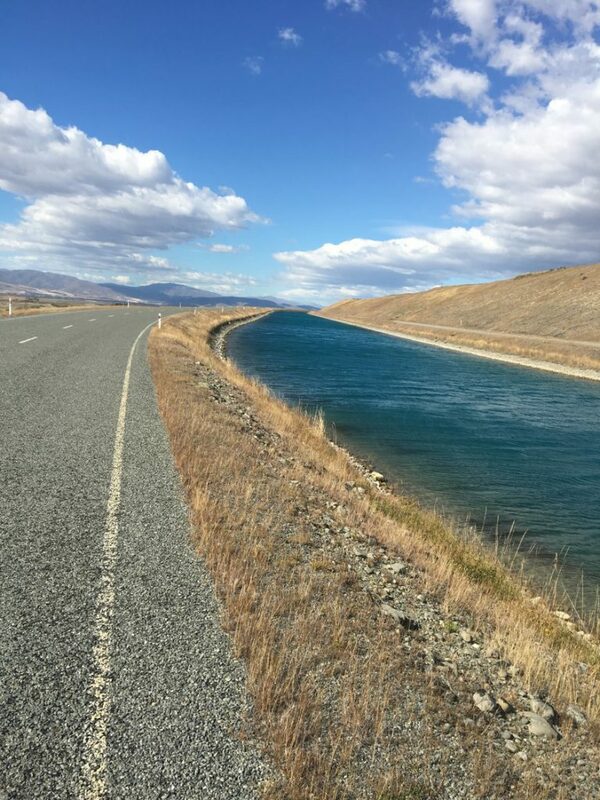 A forgotten highway, along the Tekapo Canal. Eventually, the highway turned to the west and my tailwind became a cross wind. The road turned to gravel as well, and the local hills that had been shielding me from the worst of the wind disappeared. I had no choice but to get off and push my bike. This was hard work! I had to really lean into the wind to keep myself and the bike from being blown over. Supporting the bike by the handlebars, I found that the rear of the bike would be blown down wind, so I ended up pushing the bike at an angle. Eventually, I was overtaken by a fellow that I had met at the campground. He and I pushed our bikes for a mile or so, until we found a shack to sit behind to get out of the wind. We guessed it was about 60 kph. Here is a picture of Joe pushing his bike. You might notice that the wind, coming from the right, is causing his bike to fishtail. Joe, pushing his bike in the presence of the worse cross winds I have ever experienced. Somewhere, there is a picture of me doing the same thing. After an eternity, the wind died down a bit, and the road eventually turned back to pavement. I could ride again. The fellow I was riding with was much faster than me, and I never did catch up with him. I’m pretty sure his name is Joe. Farewell, Joe! By this time, I knew that my planned destination of Omarama was out of the question. 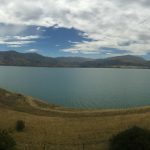 When I arrive at the south end of Lake Pukaki, I decided to continue on to the small town of Twizel, where there was a campground. I could have taken the highway, but there was this intriguing little dirt path… Oh well, you only live once! I took the dirt path and didn’t regret it at all. What an amazing ride! It wound its way through a region that reminded me a lot of the Waikaloa region of Hawaii, except that there were all of these little pine trees everywhere. I was completely alone. What a foreign looking landscape! How do you descirbe this? An Arctic tundra? Amazing ride. 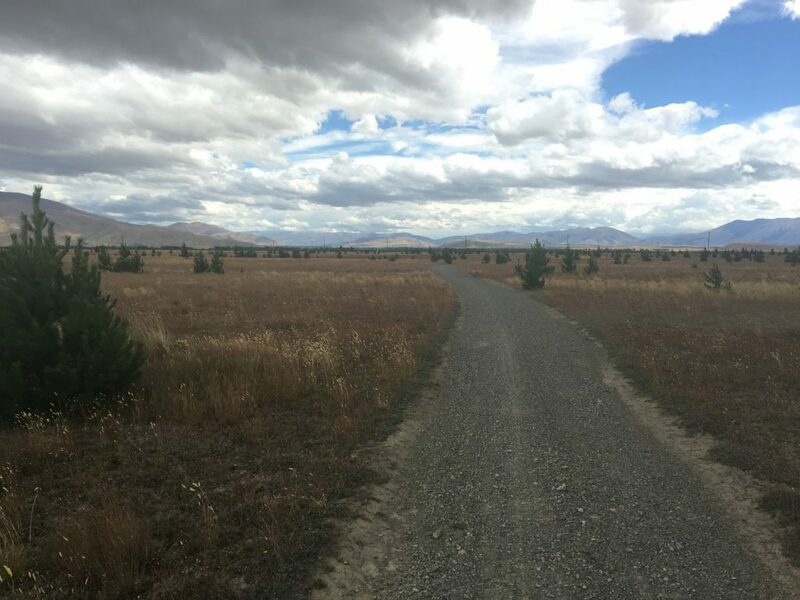 Eventually, I arrived at the campground in Twizel and set up my tent. Later that evening, I rode over to the local grocery store for some food items. It was a tiring day and I was in a reflective mood. I had ridden my bike for nearly a year and traveled almost 10,000 miles. 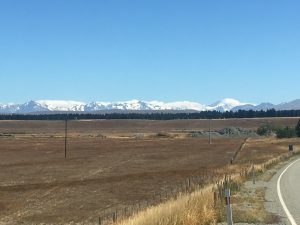 And here I was–in Twizel. One of those moments. 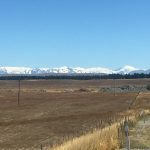 I had thought about taking a day off in Twizel, but the Wi-Fi connection (that I paid for) at the campground was non-existent. 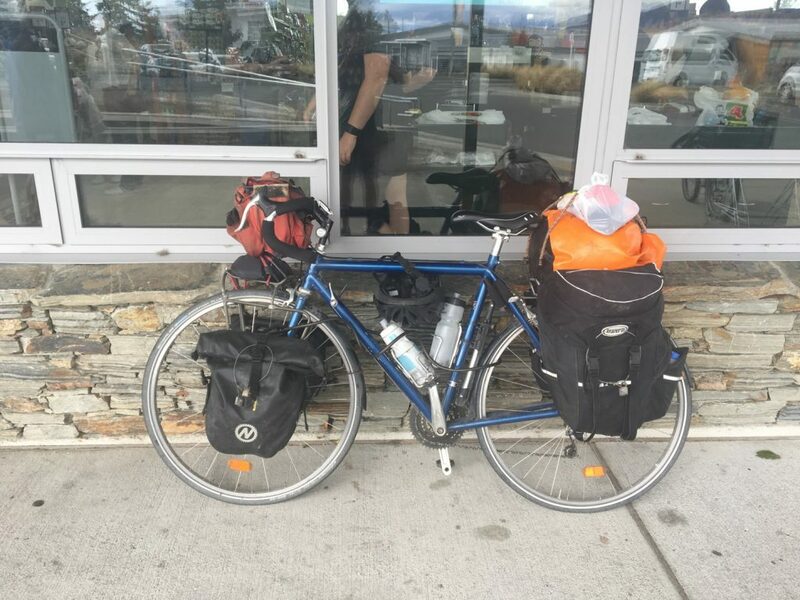 So, I got up the next morning (2/1) and rode the last 31 km into Omarama. 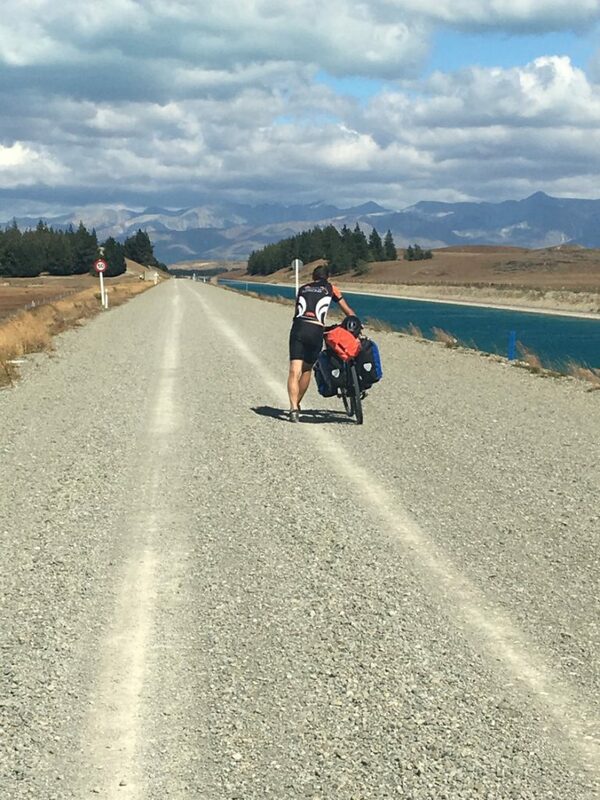 On the way I passed a spill way for Lake Ruataniwha. 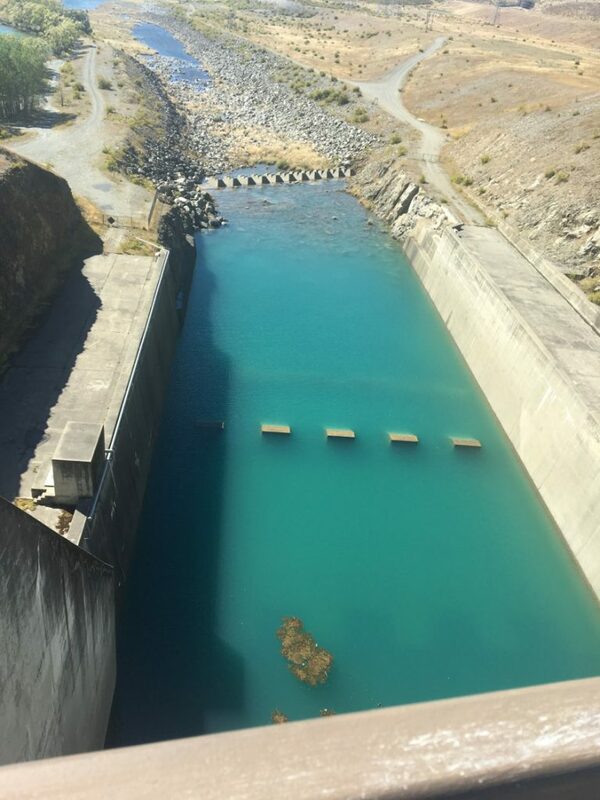 Hydroelectric power is very common in NZ, but I don’t think there were any generators on this outlet. I am struck by how blue the water in these lakes is! It was just after lunchtime when I arrived in Omarama and I thought I’d treat myself to a good meal. The local café offered a steak at a good price–the catch, however, is that you have to cook it yourself. Cooking my own steak on a rock. 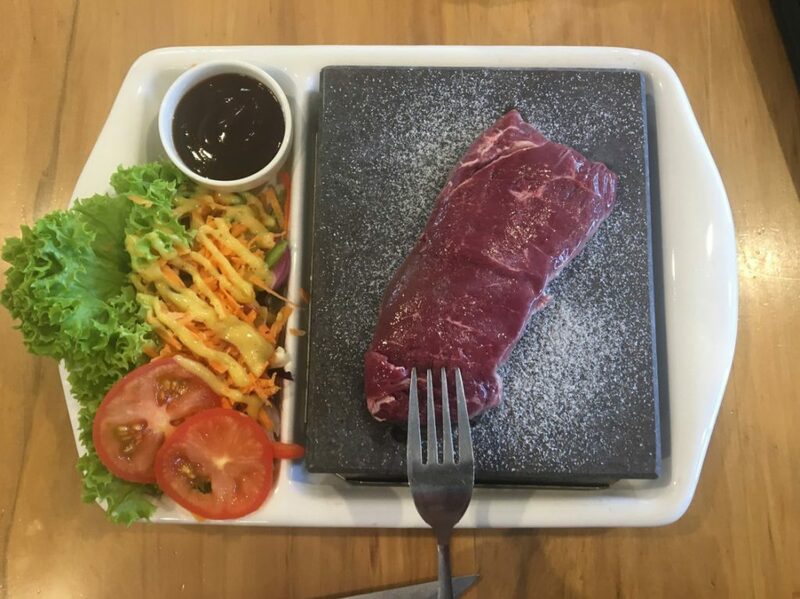 In this style, you salt the rock rather than the steak. The steak comes out raw along with a chuck of rock that has been heated (so I was told) to about 400C. I may have misunderstood about the temperature; that seems a little hot for cooking. But it was hot! You cut off little pieces and cook each one as you go. Kind of like fondue, but with molten lava. 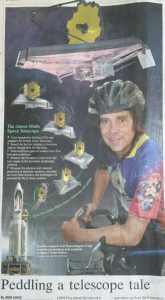 Today I will start the first day of a two day ride to Oamaru. I am not sure what is available in the middle; I may need have to do a bit of wild camping. I will check in when I can! May the wind be only at your back for the rest of your ride. You are doing well, Scott! Keep going!